MBA is glad to publish this blog post from alumna Alexa Bourne. Alexa was one of the original students enrolled at MBA when it first open its doors. She attended Alma College dancing extensively in their dance program, and majoring in English. She transferred to Ferris State University where she currently attends as an English Language and Literature major (with two writing minors), and will be graduating in May 2018. In this blog she clearly expresses the positive impact that ballet training had on her. Unfortunately, her injury impacted her ability to pursue a career in dance. Injuries in dance can happen as they do in any sport, but they are fairly uncommon. This blog illustrates how even when misfortune happens what you learn in ballet continues to benefit the dancer for life. Alex was a member of the MBA family and will always be. We are proud of what she has accomplished and know she has a bright future ahead of her. No, I didn't have the body, the feet, the flexibility, the turnout, or the training since I didn’t start professional training until it was too late. No, I would not have been able to have a career as a dancer. But this was a huge part of my life. For 15 years I pretty much lived in a leotard, and I miss it so much that it hurts. I miss tutus and tiaras, I miss the rush of performing, I even miss the pointe shoes and all the damage they did to my feet! And I remember it all. I remember the fall in high school that damaged my knee, and I remember continuing to dance through it for several years after until I reached the point where it aches almost constantly, I have difficulty straightening it, and walking is sometimes painful. I remember dancing on sprained ankles because there was no way was I going to miss my last performance of senior year. I remember dancing with mononucleosis because I didn't want to not dance (that lasted until the doctor told my instructor that my organs could burst very easily and kill me if I fell or my partner grabbed me wrong). I remember dancing always making everything better; even when I was stressed about dance, when I actually began to move, nothing else mattered. Dancing was a cure for my anxiety. I remember several pairs of brand new, un-sewn, custom-made pointe shoes still in their bag under my bed because I stopped so suddenly. I remember there being a time that I got sick of hearing Nutcracker music because I had listened to it a million times, year after year, in countless rehearsals...and I wish I hadn't taken it all for granted. I wish I had another chance to dance. But I also remember what those 15 years taught me. I didn’t just learn how to dance (ballet at least. You still don’t want to see my flailing attempts at “dancing” at a party). I gained an appreciation for music, a knowledge and understanding that I would have never had without dance. I learned that dance isn’t just an art, it’s also an athletic endeavor (anyone who tries to argue against that can fight me; my asthma, the scars on my feet from blisters, and all the old injuries that still bother me will act as witness that it is indeed athletic). I learned that dancers are some of the toughest athletes there are, but that they’re also empathic. Dance taught me too many lessons to list in one blog post, but here are some of the most important lessons I still use today, a year and a half after I stopped taking any classes, and several years after I stopped dancing at a professional training level. I learned how to listen to my body, and I learned all the physical therapy exercises to fix whatever’s bothering me. My body learned proper posture (or rather, it was drilled into me). While this may seem small, potential employers still comment on it at every interview I go to. Proper posture leaves a good impression. But most importantly, I learned the value of dedication and hard work. One doesn’t successfully go to school full-time and dance full-time without it. I learned the time management skills to be able balance two lives, and now to be able to balance a full-time course load of upper-level reading- and writing-intensive classes (ah, the life of an English language and literature major with two writing minors), as well as multiple jobs and extracurricular activities. To keep all this straight, I had to learn important organizational skills as well that began in high school with homework and a hectic rehearsal schedule. Above all, dance taught me that nothing happens without work and passion. If you don’t have passion for what you’re doing, you don’t want to do the work, and if you don’t do the work, nothing’s ever going to happen. While some people are blessed with long legs, the bone structure of a bird, or natural inhuman flexibility, the technical skills for dance aren’t something that can just be handed to you—you have to work for them. That lesson has followed me into my school and work life. I’m not naturally a straight-A student: I work for it. I’m not naturally good with technology: I work for it (quite hard, actually. Technology hates me). Though dance also taught me there is no such thing as perfection, that there is always something that could be improved upon, it taught me that with dedication and hard work you can pull off some pretty amazing feats. While I no longer spend 30-40 hours per week in a leotard, my mindset and heart are still that of a dancer. I will always miss that life, but I will also always be grateful for all it gave me. I wouldn’t be where I am or who I am without that experience. By Lorna Jarvis, Assistant Artistic Director, Michigan Ballet Academy. Summer programs are a time to work intensively on technique and artistry. Students don’t have other school responsibilities and can give all their effort to their training. Attending a summer program is important because students can make significant progress. Define clearly what your goals are for your dancer for the summer (e.g., experience a different environment? Improve their technique?, improve their acting and artistry? Develop independence skills?). Make sure to match your goals with what the programs you are considering offer. It is important for young students to receive consistent training. For dancers under the ager of 15 or who have been exposed to a particular technique for only a few years it is best to continue training in that technique. The technique that is used develops the body in particular ways, and when you change the technique this can lead to slower technique development and under or overdeveloped muscles. Once technique is solidly in place, introduction to different techniques and styles can be beneficial to a dancer as they develop versatility. If you are sending your dancer to a summer program and they are young dancers please consider sending them to a program which matches their school's style and technique rather than a program with a different style since it can negatively impact them in their progress. That is, young dancers who have been trained in Vaganova technique will benefit more from a Vaganova technique summer program. Find out as much as you can about the programs you are considering. Consider the size of the program. How many students will there be in each class? Are the instructors experienced instructors? Do the instructors have dance experience from well-known companies? What is the curriculum like? What type of classes will they take? Consider in which program will your child receive strong technique instruction and personal attention? In many programs the classes are run as master classes (this means, they are good classes, but little instruction is given) and there are many different teachers with different styles. This may not always be a good strategy for young dancers. Consistency in training is extremely important. Be aware of satellite programs that share the name of famous schools but don’t necessarily share the same faculty or quality of instruction. Some of these programs can have large class sizes and limited personal attention and instruction. Learn about the curriculum of the program and the amount of dancing your dancer will do every day. Make sure it is appropriate for their age and level. Summer programs are expensive, make sure your child will be challenged and can truly make significant progress in their training. Be aware of the housing circumstances, supervision and meal plans services. This is important since many places contract colleges that don’t necessarily follow the diets that dancers need to stay in shape. Some programs have very strict supervision others don’t. Make sure you are comfortable with the level of supervision and the amount of freedom your dancer will have. Auditions can be stressful and scary--I know, I have been to many--but here are a few tips to help you through the process. 1. Actually dance. Don't just go through the motions and do the steps, dance with soul and personality and character. Dancing with passion is how you get noticed in the crowds of people. 2. Think about the basics: straight knees, turn out, pointed feet, lifted core. Extensions, pirouettes, and jumps are great and very important, but, especially when auditioning for schools, good clean technique is key. Use your feet, turn out, knees, and core. 3. Apply all corrections. If the teacher does give corrections--sometimes they do not--or if they ask for something specific in a combination--say to turn out or place the arms in a certain way etc.--make sure to not just do it in the combination but try it immediately after they say it. They will see you working on it, and it is more likely to look beautiful in the combination. 4. Learn the combination. Students who learn the combination quickly are generally more attentive, can focus more on technique and artistry while dancing, and are going to improve more quickly, and directors and teachers know this. Technique, musicality, and precision in the combination. 5. FINISH EVERYTHING. Honestly, you should try to do all of this in regular classes as well (plus pushing yourself to increase extensions, jumps, and turns) but this is one of the most important things to do in class everyday (along with trying corrections immediately). Finish pirouettes, finish each individual movement, and finish combinations. Never spin out of a pirouette and if you do lose control then make sure to get into a confident finishing position (fourth/tendu/fifth) as quickly and smoothly as possible. Don't start the next movement in a combination with out finishing the previous movement first; it will make your dancing look sloppy. Always dance the combination until the finishing pose and then walk off nicely, as a dancer. 6. Don't show your mistakes. Smile, and move on. Always try to learn the combination, but if you do forget don't show it, keep dancing and try to follow others/remember the combination. 1. Make sure to allow plenty of time to register and warm up before the start time of your audition. 2. Wear lots of layers as most auditions are in big cities, and you may have to walk from your parking spot or public transit (you don't want to get too cold). 3. Don't warm up like you were warming up for just any class, be prepared to walk in and do saut de chats and fouettes if necessary. I have been to auditions where the barre was only ten minutes long and some where I arrived only to have them tell me the entire class was on pointe. When auditioning, plies and tendus are not a warm up or preparation for center, they are a part of the audition and you need to be performing from the first second you walk in to the studio. 4. Extra Tip: try doing your own ballet barre before class so you are really warm and using the proper muscles. Lots of of plies and tendus can help activate turnout and warm up your feet and legs, and if you are really pulling up you will start to feel more on your leg and your core will start to work. 5. Stretching is important but don't forget to start activating the proper muscles such as your core, back, feet, and inner thighs. Don't just stretch, warm up your muscles! 6. Remember when you are at an audition you can't wear warm ups either so take that into account when warming up, take off one layer at a time as you get warm so it is not a shock when you take them off for the class. 1. The number one thing when deciding what to wear is to choose something that is comfortable, makes you feel confident and beautiful, and that you can dance well in. 2. Always double check if there is a dress code for the audition as some schools have very specific guidelines for what to wear. 3. If there is no dress code, then you have to consider what color to wear. I am always partial to white as it is a classic and clean look that stands out, since the most common color students wear to auditions is black. Black can also be a good choice, it looks professional and is often slimming. I personally advise against anything too flashy--you want the judges/teachers to see you and your dancing not the sparkles, straps, patterns, and excess mesh and lace on your leotard, you don't want them to be blinded by the fire engine red or neon pink of your leotard. I think white, black, dark blue, purple, or green, burgundy, brown, grey, or even light blue, pink, or lavendar, or mint green--pastels--are often good choices. Wear what color flatters you and expresses your personality, but make sure to appear professional. 4. The cut: if your audition does not ask for a specific cut (some may ask for camisole leotards only) then you have another decision to make. I suggest something with an open neckline so your neck appears longer--no mock turtlenecks or halters. I also would avoid short sleeve leotards unless there is one you really love, that is very flattering, as it risks cutting the line of your arms and making your arms look shorter. I think the easiest option is to always choose a tank or camisole as it is a professional look, but long sleeve leotards can also be very flattering. The open neckline and lack of sleeves lengthens the line of the neck and arms, and the light blue stands out without being distracting. 5. The fit: this goes along with number one in importance, as if it doesn't fit right you won't feel comfortable and confident. Never wear leotards that are baggy or stick out (meaning there is space between your back--or stomach--and the fabric of the leotard) as then the people watching the audition can not really see your body, and it is likely that you will end up looking heavier then you are...and quite possibly shorter. It is just as bad to wear something too tight though. It will look like you are spilling out of the leotard, giving the appearance that you are, once again, heavier than you are. Also the judges do not want to be looking at your wedgie, they want to see you dancing. You don't want to wear a leotard that you are constantly adjusting either. 6. Extra Tip: try a leotard that sits right below your hip bone to make your legs look as long as possible without being cut too high. The leg line is well placed to lengthen the leg. 7. Last tip: remember they, the teachers and judges and directors, just want to see you dance. They do not really care what you are wearing, so don't stress out too much! Merde! Summer always marks a change of pace for many of us, or at least a change in our daily routines. For the students at MBA summer means the opportunity to work intensely on improving their technique and artistry, allowing students to work without the stress of homework and academic responsibilities. MBA students have the opportunity to attend summer programs at other dance academies as well as attending MBA’s summer program. This summer six of our students (Emilee Alexander, Corinne Jarvis, Madison Massara, Luca Massara, Gabe Rajah, and Sierra Post. attended programs at other dance schools nationally and internationally. Emilee Alexander attended the Long Beach Summer Intensive (which included a tour performing in China); Corinne Jarvis attended a 5-week intensive with Miami City Ballet School and two-week intensive at the Princess Grace Dance Academy in Montecarlo, Monaco; Madison Massara attended 5 week intensive at the Pennsylvania Ballet School; Luca Massara and Gabriel Rajah attended a 3-week program at San Francisco Ballet School; and Sierra Post attended the Butler University Summer intensive program. Many of these students also attended partially or in full the MBA summer program. We asked them to share their experiences with our MBA families. Last week we heard from the students about how they got into the programs and what they were like. How do you think the training and environment at MBA compares to the summer program you attended? In what ways do you think attending the summer program impacted your training? Luca stated that his experience at San Francisco will have a large impact on his training at MBA because it gave him the opportunity to work on technique classes for men only so he could focus on the needs of a male dancer. He also had the opportunity to have partnering classes 3-4 times per week which he believes strengthen his skills as a partner. For Madie, her experience at Pennsylvania Ballet focused on aspects of her dancing that needed improvement, and she also broadened her knowledge of repertoire. For Emilee, attending the Long Beach summer program allowed her to experience different teachers, who pushed her to go further. She also learned new repertoire and had the opportunity to perform. Also all of the different pieces we learned. She had the opportunity to perform seven new pieces from Long Beach's repertoire. For Corinne the Monaco program in particular helped her strengthen her passion for ballet, and helped her develop a deeper understanding of the basics of technique, the importance of artistry and the critical importance of musicality. What advice do you have for other dancers about summer programs? Corinne: Make sure to find the right program for you. It makes a HUGE difference. Focus on the basics: doing a proper plié and tendu is actually a lot harder than fouettes, and I promise, Mr. Makhateli, Miss Jaglowski and Miss Sabas and anyone else teaching at MBA will and can teach you to do phenomenal grand jetes and pirouettes and look great in a variation, but they can not make you work and focus and if you don’t listen and work on their corrections from barre, trying to apply them in center won’t work (and it is their corrections that will allow you to improve and be accepted into great summer programs and eventually get a good job). Listen to the music: it is everything to a dancer. Do not sacrifice technique or artistry because they are equally important. Enjoy what you do. When you practice on your own, practice every aspect of it: legs, arms, head, start, and FINISH. How did you get into the summer program you attended? Sierrra had to send pictures, and complete an application process. Emily and Corinne (for the Monaco program) did video auditions; Luca, Gabe, Madie and Corinne also auditioned in person at the scheduled auditions in Chicago. Luca, Gabe, Madie and Corinne auditioned for multiple programs and were accepted to many of them. What do you think was the best aspect of the summer session you attended (other than MBA)? Sierra said she enjoyed the small size of the classes (abut 15 students) that allowed for individualized attention, Madie enjoyed learning Balanchine choreography as well as classical variations, Luca enjoyed making new friendships with other young people from around the world who share his passion for dance and enjoyed working with new and different teachers. Corinne indicated that from the Miami program she enjoyed working on Balanchine and classical variations, working on jazz technique, performing in the company’s costumes, and she loved trying different steps in pas de deux class and learning to dance with different partners. From the Monaco program she loved the amazing teachers and the individualized attention (12 students in her class with dancers from all over the world including students from the Bolshoi, Paris Opera, and La Scala). She also thought that the contemporary classes were phenomenal in which she learned two different choreographies from the Les Ballets de Monte Carlo’s repertoire. Here is a quote from Corinne: “all the teachers were amazing because not only did they push your technique to the limit, but they did not allow the students to compromise by shutting down their face and arms and losing quality, expression, and artistry. They pushed everyone to maintain both technique and artistry as well as stressing the importance of musicality”. What did you NOT like about the program you attended? For Sierra the program was too short (3 weeks). For Luca: “The dorm food, and the long, hot walk to the studio”, and for Madie, “The nasty food and having to get out of bed at 6am during summer vacation”. Emilee loved everything about her program. Corinne felt the Miami program was not a good fit for her, the classes were very large (35 dancers in her class), and there was not much opportunity to repeat exercises or mark steps in the back. For the Monaco program she could not think of anything she did not like, except perhaps for the food and the hard bed in the dorm. The intrepid travelers did get re-booked onto a direct flight from Warsaw to Chicago which touched down about 40 minutes earlier than their original flight was scheduled. By 8:30 they emerged from customs, immigration, and baggage claim into the waiting arms of family and friends. Lorna and Corinne stayed behind in London for a few more days. What an exciting way to close our tour in Poland. We left early morning to the bus station in order to travel to Lodz. We got to Lodz at 10:30, and arrived at the theater shortly after that. We had 2.5 hours of free time so we all walked to a mall (about 1.5 miles). The dancers wanted to buy gifts and souvenirs since there has been no time for them to go shopping. We were back at the theater by 1:15 had lunch at the cafeteria and then had class. This was followed by a 2.5 hour rehearsal, with 40 minutes to get ready for the show. For our last performance we shared the stage with four soloists/principals from the Polish National Ballet. They were amazing! They dance several pas de Deux (Sleeping Beauty, Tristan, Chopiniana, Don Quixote, and a male solo contemporary piece). Our dancers stepped up their game since they were performing with such incredible dancers. This really was MBA dancers’ best performance in Poland! 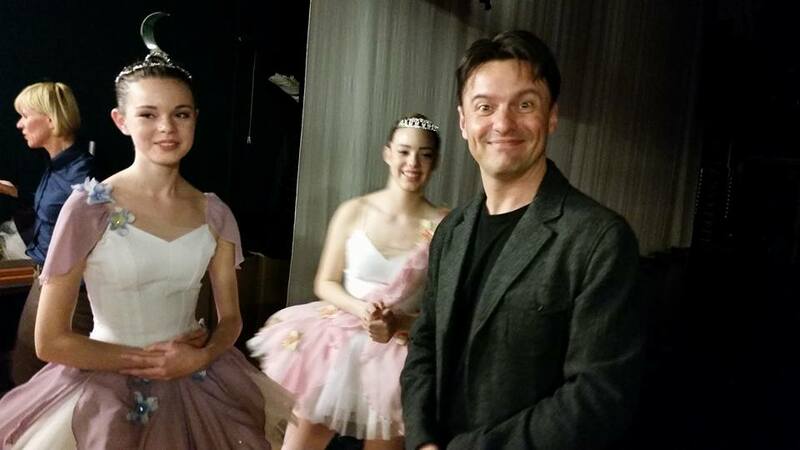 It was even more challenging since Breanna and Maria danced the bridesmaids’ variations of Don Quixote with the professional dancers, and Corinne danced Swan Lake with Eduard Bablidze. Julianna did a wonderful job dancing dying swan. All of this with very little rehearsal. Our dance students looked great. The audience received the performance well, and there was lots of clapping at the end. After the performance we got rides back to Warsaw and made it to the hotel a little before midnight. Our dancers were all up late since they still had to pack so we could come home the next day. Everyone is sad that this amazing experience is over. I know each dancer that came on this trip will remember it for the rest of their lives. It was fun, exciting, stressful and a wonderful opportunity for each of them to grow as dancers and as individuals. I want to thank each of the dancers for working together so well, representing the school well, and working so hard. Thank you for your patience and dedication. Thank you to Nikoloz for arranging this tour. Thank you to Darla for being a wonderful chaperone, and of course to Eduard Bablidze for everything he did for us during our time here. You are fantastic, Eduard, and we love you. We also thank Ana and Elene for allowing us to keep Eduard away from them for 17 days! We will miss the Bablidze family and Poland! ps. We could not complete our travel without more adventures! When we got to the airport in Warsaw we checked in for our flight and were told that our flight was 2 hours delayed. Around 11:30 our group was told that there was no way we will make our connection to Chicago. So the group was rebooked on Polish airlines LOT on a direct flight from Warsaw to Chicago. We hope the new flight arrangements work well for everyone. Our dancers got a huge challenge today. They were invited to take class with the Polish National Ballet Company! They all worked very hard and did wonderfully. The class was fast paced and almost entirely in Polish with a few English words here and there. It just shows how dance is a universal language. The students kept up with the class just fine. After it we were invited to watch rehearsal for the end of the year program of the Polish National Ballet School. We watched three different casts do the same pieces of what seemed to be a fairy story ballet choreographed for them by the school director. The students were the more advanced students in the school and they were 16-18 years of age. We then had lunch at the Opera House cafeteria, and started our own rehearsal from 2:00-4:30. After that, we got ready to attend a performance of the opera Mary Stuart. We had dinner at the cafeteria again relaxed for a bit, and then went to the House to watch the Opera. It was a very interesting production with amazing singers and sets. For several of our dancers this was the first time ever watching/listening to an opera. I must admit that a couple of them fell asleep! (Understandably since they were dancing all day, and have had two very busy weeks). It was really nice to be in the Opera House in the audience. It is an impressive and beautiful theater. Many of our dancers are saying that they are sad the tour is almost over. They wish they could stay longer! Even though we have kept them extremely busy and they have had little time to be tourists and no time for shopping, they seem to think this has been an amazing experience. Tomorrow we get up early so we can take a bus to Lodz for our last performance. It will be an exciting closing show to the tour. We will be dancing with several dancers from the Polish National Ballet, with Breanna and Maria performing two of the Don Quixote Bridesmaids variations, Julianna dancing Dying Swan, and Corinne dancing the pas de deux from Act II of Swan Lake with Eduard Bablidze. I could not be more proud of our dancers! I hope you will all be thinking of them as we close our tour tomorrow night. Looking forward to seeing everyone at home soon. Dzien dobry! (Good morning!). I can’t believe we have been gone for two weeks already! Our trip is quickly coming to an end. The surprises keep coming for our dancers. Today was mother’s day in Poland so everything was closed because of the holiday. The dancers had the morning off, but unfortunately there was not much to do since everything was closed. We did walk for a mile to make it to the mall only to find out it was closed. The walk was nice and it was a beautiful morning. We picked up from our hotel at 12:30, arrived at the Opera house a little before 1:00, and the dancers had class at 1:30. After class we had rehearsal, and at 4:00 we were told we could move to one of the big studios. The studios are phenomenal! very spacious, with excellent sprung floors and gorgeous chandeliers. Once we were in the big studio one of the main company teachers came to watch the rehearsal and gave feedback to each of the dancers in the rehearsal. It was an amazing opportunity for our dancers! I believe they learned a lot from him and each of the pieces is even stronger and more beautiful now with his help. It was clear that each of our dancers felt the pressure and they all were working extremely hard. I was very proud of each of them. Rehearsal got extended until 6:00. After working so hard, we went for a walk in the old town (the part we missed yesterday), and had dinner there, after dinner the dancers stopped for ice cream and we walked back to the Opera house to get taxis back to the hotel. Our dancers are now all laughing together in the room next to mine sharing the highlights of the day. They are all very excited and also exhausted. What an incredible day we had today! We spent the day at the Warsaw Opera House (http://teatrwielki.pl/en/the-theatre/place/) . We had a guided tour of the Opera house for our group. The stage was HUGE with all kinds of trap doors, and state of the art technology. The theater has four different types of curtains that are used depending on the type of production, We got to see the workshops where they build the sets and the painting room where they design and paint the backdrops. Got to see the dressing rooms, the costume shops, where they make the costumes, where they clean them, and where they keep them. They have over 5000 costumes catalogued in their storage area. Some of our dancers were allowed to try some of the costumes on. Then we got to sit in the house. It was an amazing experience! 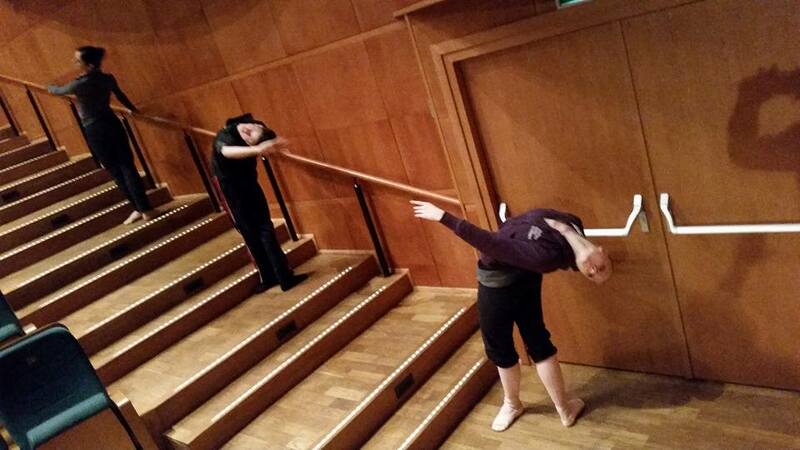 We were then escorted to the fourth floor where the Polish National Ballet has their studios. We were invited to watch the class of the professional dancers, and then watch a rehearsal of Les Sylphides (Chopiniana). Two choreographers from the Bolshoi were there to set the piece and today was the last rehearsal before they go back to Moscow. It was such a pleasure to see the original choreography, and the excellent quality of the dancers. We then had lunch at the cafeteria, and found the small studio we were allowed to use for rehearsal. Nik taught a short class then we rehearsed the program for our last show. Eduard decided to surprise two of our dancers today by having them learn and rehearse The Swan Lake Act II Pas de Deux (Corinne), and the Dying Swan solo (Julianna). After the rehearsal he and NIkoloz decided that the two of them will dance the pieces in our last performance in Poland on Saturday May 28. The girls have two more days of rehearsal before they get this great opportunity to dance these classical pieces in Poland. As if that was not enough after rehearsal we walked a few block to get to Old Town, and got to see incredible architecture, churches, beautiful little streets, and the square at the heart of Warsaw. The city is absolutely beautiful! We finally made it back to the hotel by 9:00 andthe dancers are now all settling down in their rooms. Today was one of those days that memories are made of. What an incredible experience for our MBA dancers! We started our day with a 30 minutes walk to the dance school where we were holding master class and workshops in 80 degrees weather! 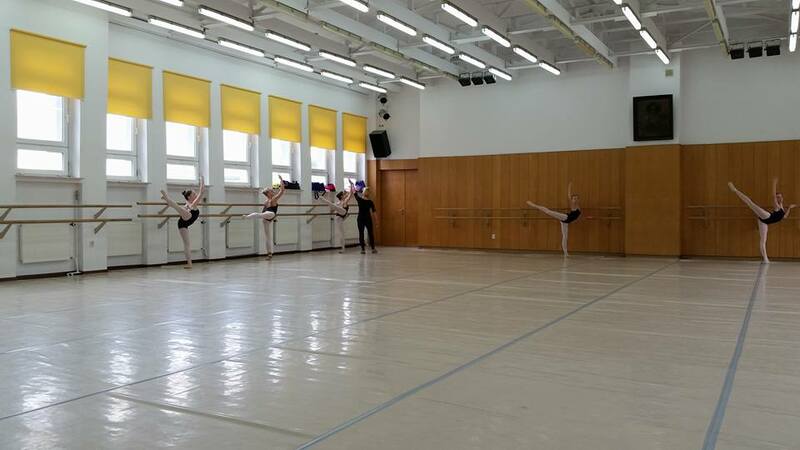 When we got to the school our dancers got ready and then took class with Nikoloz while approximately 30-40 students watched. After the class we took a picture with them. This was followed by two ballet classes one taught by Nikoloz to the older students and one taught by Lorna for the younger dancers. Alissa, Natasha and Corinne helped out in Lorna’s class. The dancers were between 9-15 years of age and had very little experience with ballet but they were all very disciplined and attentive. They seem to enjoy the classes and be appreciative of our work. After the class we had lunch and then took a taxi back to the hotel. We had one hour free before we had to leave for the bus station so several of the dancers went to a mall that was 2 blocks from the hotel. We boarded the bus at 5:30 PM and made it back to Warsaw at 8:00 and 8:45 to the hotel. We were all very tired. Tomorrow we will get to visit the theater where the Polish National Ballet performs (we will get a tour), and then watch a class and rehearsal of the Polish National Ballet. After lunch we will have our own rehearsal as well. Tomorrow will be a long and hectic day. Palaces, gardens, and dancing. That was our day today. We started our day with a very impressive breakfast buffet at the hotel. We were escorted on a walk from the hotel to the cultural center where we performed which was about a 15 minute walk. Once settled in the theater we had to wait for the marley floor to be laid so we could start class. It was nice to have a full class (1.5 hour) for a change rather than just a warm up. After class there was a two hour rehearsal. While the dancers where in class with NIkoloz, Lorna and Darla ventured to a near by park they saw on the way to the theater. They found that in the park was a palace with a beautiful garden and classical statutes. They walked around the place and took pictures. After rehearsal we had dinner at a restaurant next to the theater, then Darla and Lorna took the dancers to see the palace and gardens. They were all very excited to see this beautiful place. We then went back to the theater for the performance. The cultural center auditorium was more modern, and small. Unfortunately, for the first time the house was about half full. However, they were very receptive of our dancers. Tonight we danced Copland trio, Awakening of Flora, Concerto in Modo Antico, Song for Viola, Carmen, Sirynx, and Don Quixote (Corinne and Julianna did the Bridesmaids variations). After the performance we walked around the center of town which is full of outside cafes and restaurants, beautiful plazas and fountains. Today was 80 degrees here, so the evening was very nice and comfortable. Tomorrow we go to the ballet school to give master classes and workshops, and then will go back to Warsaw in the evening. Enjoy the pictures. Our Sunday started with some of the dancers attending Catholic Mass. They walked 20 minutes to the Church, attended the service and came back to the hotel. The rest of the group slept in. At noon we checked out of our rooms and took a short walk to a nearby mall. The dancers had fun window shopping while Lorna, Darla, Maria, Nikoloz, and Gabe had coffee. Lorna took the opportunity to buy a new suitcase since our costume suitcase broke and we have been duck taping it for the last 2 days. We went back to the hotel for a 2:00 departure to the bus station. Our bus to Bialystok left at 3:00 PM. We had a comfortable ride (but very bumpy), and arrived at Bilaystok at 5:30 and went straight to the hotel. A very beautiful old hotel with more spacious room and lots of very beautiful fine details. We had a great dinner (salad, chicken and rice), then some of the dancers went on a walk with Darla while NIk, Eduard, and Lorna worked on the schedule and programming for the next two days. The dancers came back from their walk settled in their rooms to do a laundry and sleep. The day of travel/day off was nice for our dancers who have been going full steam for over a week. They were happy to have a quiet day. Tonight is our penultimate performance. We go back to Warsaw tomorrow night, and perform in Lodz on Saturday night. The in between days will be spent in Poland where our dancers will have the opportunity to watch company class of the National Polish Ballet, the Chopin museum, attend an Opera and just be tourists. Today was the last of three shows, in three cities, in three days. We took an early bus to Siedlce from Warsaw and arrived at 10:30 AM. We walked to the theater which gave us an opportunity to enjoy this beautiful town. The cultural center there was larger than the ones we have been in so far. The theater lobby was beautifully ornamented with musical notes and nice couches. Soon after our arrival the director of the cultural center arranged for a private tour of the museum that has religious artifacts and art from the 15th century. These were all pieces that have been found in churches throughout Poland. Most of them were in ruins, and people thought it was garbage and they were ready to be thrown away. The artifacts and art work were recovered and restored, including an original painting by El Greco. The tour guide explained how churches where set up then, and described a lot of the symbolisms of the artifacts and art. They have an impressive collection of priest's robes and we received an explanation of the symbols in those as well. We also got to see a wind pipe organ and got the opportunity to play it! We also saw beautiful leather bound religious books and a book of church music. The tour ended in a room where we could sit only a few feet away from the painting by El Greco of St. Francis, while we heard an explanation of the painting by our guide. She was wonderful answering our questions and gave us bookmarks and brochures as we left. We invited her to the performance and she came! After the tour we were escorted to a very nice restaurant and had a great lunch. We then went back to the theater had a an hour to get ready for class and rehearsal. Class and rehearsal went well. The performance was very long the other schools were first and took 1.5 hours, so we did not get to be on stage until 8:45. Our students did very well and Corinne got the opportunity to dance the Don Quixote pas de deux, as well as the variation and coda with Mr. Eduard Bablidze. Corinne was selected by Mr. Bablidze to dance this part with him. Maria and Breanna were also invited to dance two of the variations and did an amazing job! I was very proud of our students that they could dance a difficult piece with very little rehearsal, borrowed costumes, and do it so well. After the performance we came back to Warsaw and did not make it back to the hotel until midnight. Everyone was exhausted. Tomorrow we have a free morning then on to Bialystok in the afternoon. Before that though I have to buy a new suitcase since our large suitcase with the costumes broke and we have been taking it to places for the last two days with duck tape all around it. New suitcase today. Thank goodness for duck tape! Another busy day in Poland. We left the Gdansk State Ballet School and Ballet School Hotel at 8:45 and we were on the bus by 9:30 AM. Got to Warsaw by 2:30 and went straight to the theater. Nikoloz and Lorna worked on changes to the program because the stage was very small. While we did that Eduard taught a warm up class to the dancers. Then they had a one hour rehearsal (walk through the pieces), had something to eat, and had a performance. Eduard suggested that Corinne dance the Don Quixote pas de Deux with him tonight and tomorrow night. They did one run through of the pas, and they performed it! Way to go Corinne. Eduard was impressed by Corinne's courage and knowledge of the pas de Deux. The audience received the program well. Breanna performed Carmen, and one of the Don Quixote variations while Julianna did the second variation. Everyone has been performing really well particularly under unpredictable circumstances. Corinne did an excellent job dancing a difficult pas de Deux. It was an amazing opportunity to dance with someone of the caliber of Mr. Bablidze and in a European city. We are spending the night in Warsaw but are off to Siedlce tomorrow for another performance. After that we get a day off where the dancers can rest and be tourists. We had a leisurely morning, with a very short rehearsal for Don Q variations at the ballet school before leaving for Wejherowo for today’s performance. We left at 1:00, got to the theater at 2:00, and had class from 3-4, followed by rehearsal from 4-5:30, a quick dinner, and then it was time to get ready for the performance. The performance was at the Cultural Center of Wejherowo. One of the students from the Gdansk State Ballet School who last month won the Riga Ballet competition danced two classical variations in the program. Eduard Bablidze and his wife Ana danced Swan Lake pas de deux, and Don Quixote pas de deux. They decided two days ago to invite four of our dancers to dance two different variations from Don Q with them. Tonight Julianna Ball and Corinne Jarvis had the opportunity to dance the two variations with the professional couple. Both girls did a fantastic job performing difficulty piece with only two 20 minute rehearsals. Way to go girls! Corinne in a borrowed tutu for the Don Quixote variation she and Julianna performed tonight. Everyone did a wonderful job tonight. The 350 seats theater was almost full, and at the end of the performance there was a standing ovation, and Mr. Bablidze invited each one of our dancers to bow individually. It was a very successful performance. I was very proud of each of our dancers tonight. Tomorrow we start early travel 6 hours and perform!. Although we are all having a good experience some of us starting to miss home and family. We finally got to be tourists today! After our regular breakfast our guide met us at the lobby and off we were to visit Old Town in Gdansk. We took the tram to Old town and got to see a little of the city that way. Once in Old town we walked around beautiful old streets with gorgeous architecture, got to also see the solidarity monument and the solidarity museum. In town, we learned about the history of the City, about several important landmarks, including several of the gates to the city, and some of the canals. We visited the Church of St. Mary’s and many of our dancers climbed to the top of the tower! Those of us who ventured up the narrow spiral staircase got the chance to enjoy an incredible view of the city from above, including the winding rivers. It was so beautiful! Tomorrow we go to Wejherowo, to rehearse and perform. It will be a long day. We will see what adventures come our way. I hope they are better than the adventures some of the members of our group have had while trying to find a bathroom. Bathrooms here are marked by symbols a circle and a triangle. Figure out which one is which! Some of our group members walked into the wrong bathroom!. More news soon. A very busy and exciting day today!. 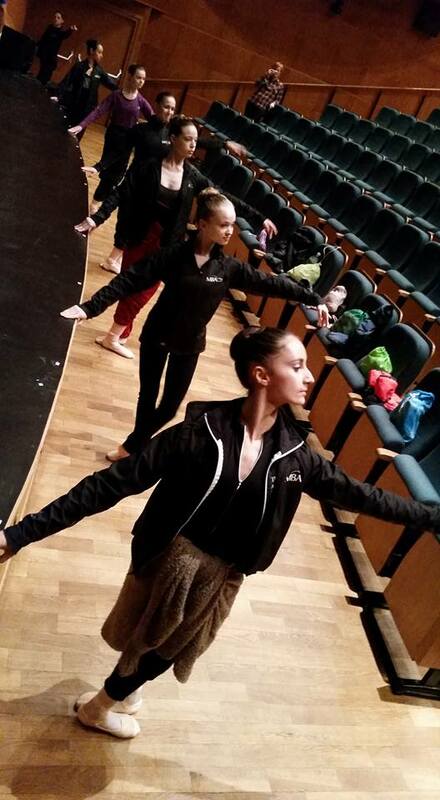 Our dancers were invited to observe two technique classes of the State Ballet School in Gdansk. The students are preparing their exam class today. Their exams are this coming Saturday. It was very interesting to see the Vaganova approach taught by a Russian and a Polish teacher. Our dancers learned a lot by watching those classes today. We then all observed Polish Folk dance (Character) class. It was fantastic!. It was with the students in level 4 and they were wonderful. For short sections of the class they asked for volunteers to dance with them and Corinne and Julianna joined them. It was lots of fun! In the afternoon our dancers had a character class of their own, and then a very engaging modern dance class. That was followed by 3 hours of rehearsal for the performance coming on May 19. The school we are staying at is a State Ballet school with great studios, a very comfortable dorm, and a nice dining room. The dancers were offered physical therapy services and they all used them, massage, laser therapy, and a sauna. They loved it! Gabe is developing quite a following among the young ladies of the school! Tomorrow morning we will get a tour of the old town in Gdansk. We are all very much looking forward to seeing the city. In the late afternoon early evening we will have class and rehearsal. On Friday we will be back on our way to Warsaw where we will perform that night.